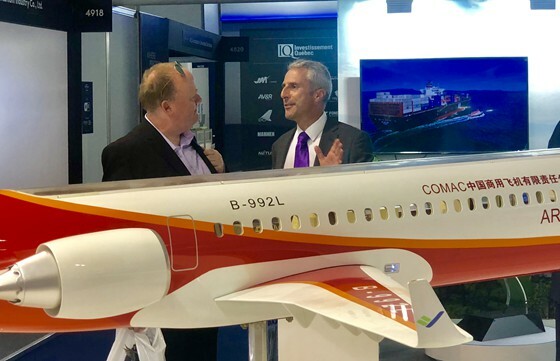 COMAC attends 51st Farnborough Airshow, showing latest achievements in aircraft programs__Commercial Aircraft Corporation of China, Ltd.
COMAC attended Farnborough Airshow opened on July 16th, 2018. The 51st Farnborough International Airshow was opened at Farnborough Airport on July 16th, 2018. Commercial Aircraft Corporation of China, Ltd. (COMAC), which attended the Farnborough Airshow for the fifth time, presented a 1:10 mockup of C919 aircraft in hybrid cabin configuration, mockups of ARJ21 aircraft in executive aircraft configuration, business aircraft configuration and hybrid cabin configuration, and a 1:15 split-type mockup of CR929 aircraft with three-class cabin layout, which comprehensively showed the development progress of C919, ARJ21 and CR929 aircraft as well as the development of COMAC. 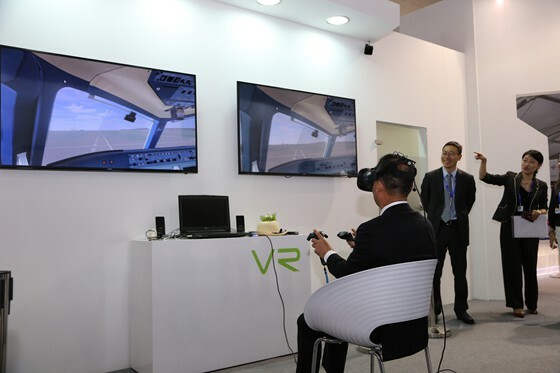 Meanwhile, it was the first time to show the excellent performance of ARJ21 aircraft to the public in the form of VR interactive experience. Mr. Zhao Yuerang, President of COMAC, led a delegation to attend this airshow. This airshow was just held at the 10th anniversary of COMAC. As C919 aircraft has completed the maiden flight and entered the phase of flight test and certification, ARJ21 aircraft has marked the second year of commercial operation, and CR929 program has entered the preliminary design phase, the company has opened up a road of innovation and development for China civil aircraft industry, moved from the initial stage to the growth stage, and entered a new stage of development. On the occasion of the second anniversary of route operation, ARJ21 aircraft ushered in the 100,000th passenger on June 28th, 2018, indicating that the aircraft has basically achieved the goal of safe and smooth operation, and the route operation has achieved periodic results. At present, ARJ21 aircraft have flown eight routes including Chengdu-Changsha-Hongqiao, Chengdu-Hefei-Wenzhou and Chengdu-Shangrao-Nantong. The number of navigable cities has been increased to 13. While gaining the market recognition, ARJ21 aircraft is continuing with design optimization, has completed crosswind expansion certification flight test in Iceland on March 26th this year, and has already possessed the capability of operating safely in all weather conditions required by airworthiness regulations. The flight test of C919 aircraft is advanced according to schedule. C919 AC102 flew from Shanghai to Dongying Shengli Airport in Shandong province and started flight test on July 12th. The program officially enters the mode of carrying out flight test simultaneously in different places. C919 aircraft completed 2.5g ultimate load static test on the same day. As planned, COMAC will put six test aircraft into flight test. The three-year early demonstration of CR929 program was completed, a joint venture was established on May 22nd, 2017, the aircraft was officially named as CR929 on September 29th of the same year, and the program has entered the preliminary design phase. Up to now, all the recovery work of the Request for Proposal (RFP) for propulsion system has been completed as scheduled. 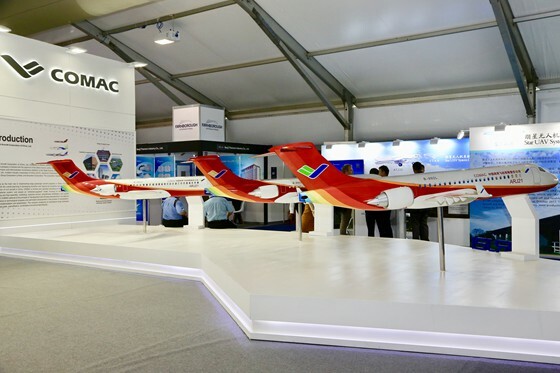 During this airshow, COMAC will also carry out product promotion to comprehensively introduce the development and construction of the company together with the development progress of ARJ21, C919 and CR929 programs centering on aircraft products, program progress, customer service construction, etc., and carry out concentrated market promotion focusing on potential customers. The stand of COMAC attracted wide attention. 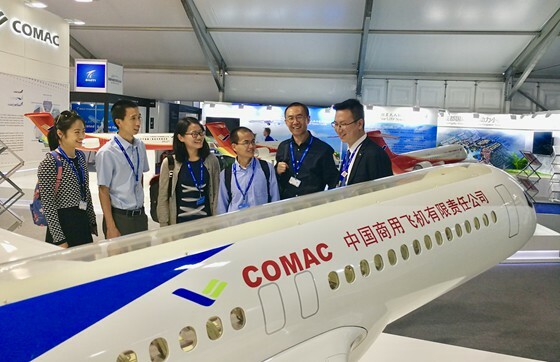 People visited the stand of COMAC. A photo of a visitor in VR interactive experience.